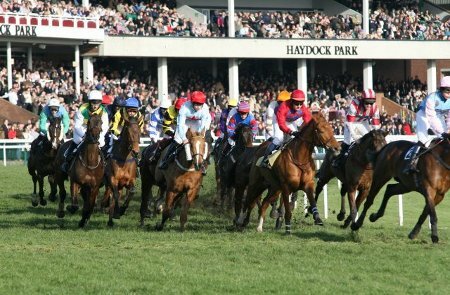 Haydock Park Racecourse is one of those rarecourses that has both top class flat and jump racing. The Haydock Sprint Cup is the main flat race of the summer, but it can boast a quality programme throughout the season. The national hunt programme is similarly studded with classy action with the Edward Hanmer, Peter Marsh and Tommy Whittle chases in November, December and January respectively. These are all targets for the country's leading chasers, which is what helps to make Haydock Park Racecourse so popular! Flat - A galloping, almost flat oval track which is 1m5f round. The run-in is four and a half furlongs and there is also a six furlong straight course. Jump - A testing circuit which is left-handed and almost a mile and five furlongs. The fences are notoriously stiff with a long run-in while the hurdles track. The racecourse is located close to Ashton, between Manchester and Liverpool, and is accessible via the M6 (junction 23) and then the A49. Free parking is available. If you’ve been wanting to place some bets for the races that are currently running at Haydock Racecourse, you might be interested to learn that you can do so from the comfort of your very own home! At the online sportsbooks featured below, you can place real money wagers on virtually every race that is running at Haydock Racecourse! All of these online sportsbooks are extremely reputable and they all offer incredibly fast payouts, so we’re confident that you’ll be impressed with everything that they have to offer! One of our favorite online sportsbooks at the moment is Paddy Power. That’s because they are currently giving away up to $50 in free bets to all of their new customers! These free bets give you an opportunity to place some wagers without having to worry too much about the outcome of your bets, which is why we encourage all of our website visitors to take advantage of this great offer! So head over to Paddy Power today to get your free bets and to get in on the action by placing your wagers online! Click here to bet on Haydock Park races at Paddy Power! If you’re looking for a fun and exciting online sportsbook that you know you can trust, you can’t go wrong with the one and only Bet365. They have been around for many years and they are well respected throughout the betting community, which is why we are happy to recommend them to all of our website visitors! At the moment, Bet365 is giving away up to $200 in free bets to all of their new customers, so visit their website today to learn more about this great promotion! Click here to bet on Haydock Park races at Bet365! Ladbrokes is an established and respected online sportsbook that offers great odds for some of the most popular races in the world; including all of the races at Haydock Park Racecourse! At the moment, they are giving away a cool $50 in free bets to all of their new customers, so there has never been a better time to get in on the action at Ladbrokes! Click here to bet on Haydock Park races at Ladbrokes! One of the most popular and trusted online sportsbook is Bodog. They have been around for years and during their tenure they have maintained a great reputation amongst punters from around the world. We recommend Bodog to anyone who might be looking for a place where they can make wagers online from the comfort of their own home because they are without a doubt one of the absolute best online sportsbooks! Click here to bet on Haydock Park races at Bodog!